MARINE CORPS AIR GROUND COMBAT CENTER (TWENTYNINE PALMS), Calif. An initial test of the Squad X Experimentation program from the Defense Advanced Research Projects Agency (DARPA) successfully demonstrated the ability to extend and enhance the situational awareness of small, dismounted units, according to reports from DARPA officials. In a recent series of tests over one week at Twentynine Palms, U.S. Marine squads using Squad X improved their ability to synchronize maneuvers, using autonomous air and ground vehicles to detect threats from multiple domains – physical, electromagnetic, and cyber – providing critical intelligence as squads moved through battlefield-like scenarios. Squad X -- aimed at enabling Army and Marine dismounted units to use autonomous systems equipped with off-the-shelf technologies and novel sensing tools developed via DARPA’s Squad X Core Technologies program -- is intended to boost squads’ situational awareness and lethality, allowing enemy engagement with greater tempo and from longer ranges. Lt. Col. Phil Root (U.S. Army), the Squad X program manager in DARPA’s Tactical Technology Office, said that Experiment 1 demonstrated the ability for the squad to communicate and collaborate, even while “dancing on the edge of connectivity,” as he put it. Squad members involved in the test runs praised the streamlined tools, he said, which allowed them to take advantage of capabilities that previously had been too heavy or cumbersome for individuals to use in demanding field conditions. 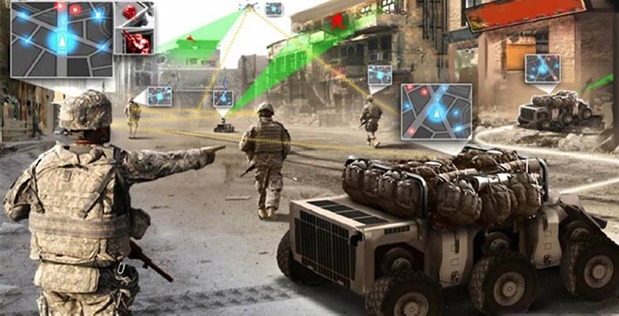 Two performers, Lockheed Martin Missiles and Fire Control and CACI’s BIT Systems, each are working on different approaches to provide unique capabilities to enhance ground infantries, both with a focus on manned/unmanned teaming, according to DARPA. Experiment 2 is currently targeted for early 2019.